FOCUS TRANSPORT: The lengths some people will go ! The lengths some people will go ! During 2015 Richard journeyed halfway around the world, but not necessarily to find ex.London buses. Well that's what he told his good lady wife when they visited New Zealand. So let us leave Richard to explain what this is all about. Quite an interesting story behind this picture. 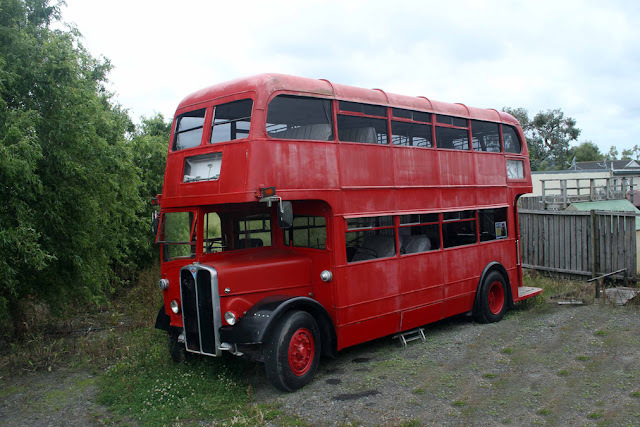 I had already located former London Transport's Weymann bodied AEC Regent RLH 50 in Parakai on the North Island (it has since moved to the South Island) and next on my list was RLH 45. I had been in contact with the owner (Robbies Fun Bus) prior to flying out to New Zealand and was advised that the bus would be on Waiheke Island, a 35-minute ferry trip from Auckland. My only problem was that Robbie had been unable to tell me where on the island it could be found and I was unable to contact him on arrival in NZ. 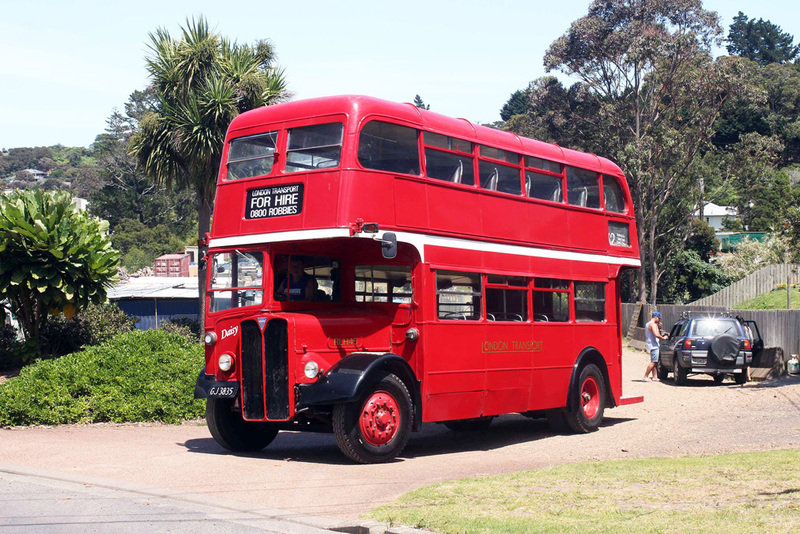 Never one to let such a minor issue get in the way, I ventured out to Waiheke, thinking someone must know where a red double decker could be found. The island is larger than it looks on the map and my first thought on arrival at Matiatia Ferry terminal was to ask the driver of a local service bus, thinking he would probably be the person to know. Everyone I had met up until now had been exceedingly friendly, but this particular driver was the exception to the rule, so I departed on route 1, none the wiser as to where the Regent could be found. Having travelled through some familiar place names such as Blackpool, I left the bus in Ostend and made further enquiries. I was advised that it could be found near Onetangi, a little bit further East, and was given some street name that I have since forgotten. Upon arrival, I soon realised that I was walking up a very pleasant residential street and although anything can be found anywhere in New Zealand, it did not look particularly promising with regard to the Regent. There was no sign of it anywhere, but just as I was about to return to the main road to make further enquiries, this couple came walking down the road. I asked if they knew of any red double-deckers in the area and much to my surprise they said they had seen it out and about in Onetangi the previous day. Alas, they did not know where the vehicle was kept. I also had one other other problem - my mobile phone battery was now flat. I had a telephone number for Robbie, so out of desperation I asked the couple if I could borrow their mobile to contact Robbie. Without a moments hesitation they dialled the number and much to my surprise Robbie answered. I thought he would be on the mainland, but he was staying at his house on the island. He said he was a bit busy, but if I could wait an hour he would come and pick me up and take me to the bus. I can think of far worse places to wait than Onetangi Beach, so I thanked the couple who had lent me their phone and waited. True to his word, Robbie turned up 60 minutes later (he had no trouble in picking out the pasty white Englishman by the side of the road) and drove me back to Ostend where the bus was in a locked compound. Robbie unlocked the compound, started the bus and reversed out to pose the bus up for the nearside picture above. He then took me for a quick 5-minute spin around Ostend, posed the vehicle up for an offside shot, insisted that I admire the interior of the vehicle, before putting the bus away. His hospitality didn't end there, as he then drove me up to his rather nice house and offered me a beer. I had a chat and discovered that Robbie hails from Glasgow. He knows the UK bus scene quite well and has a number of other ex.UK half cabs and suchlike, which he keeps on the North Island. By the sound of it, his "fun bus" business would appear to do quite well. Bearing in mind I made this visit on a Sunday, Robbie could not have been more accommodating - he even gave me a lift back into Ostend, so I could continue my travels around the island, before returning on Mr.Souter's ferry to the mainland. Having travelled halfway around the world to photograph the vehicle, I cannot express how grateful I was to Robbie and the time and trouble he took on my behalf. Already mentioned was similar London Transport bus RLH 50 in the then owner's back yard. 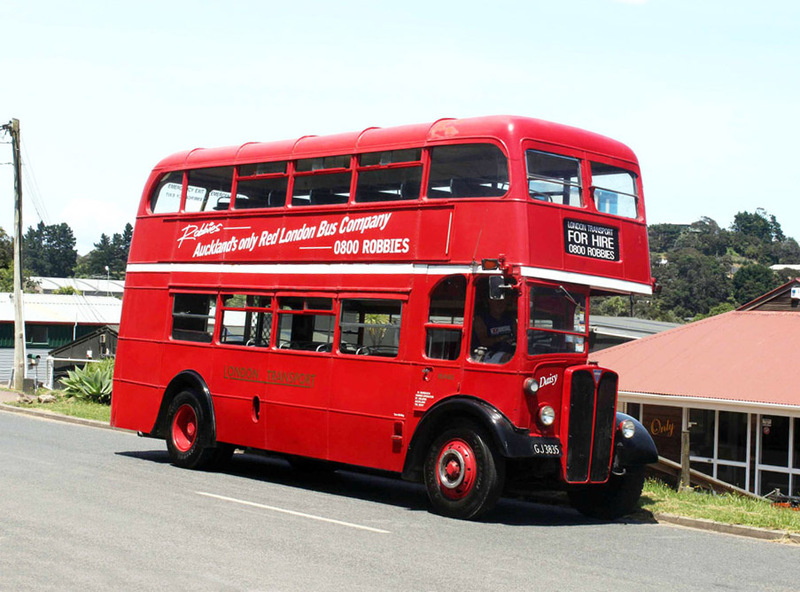 The bus has been in New Zealand for 45-years. Yet again, the owners could not have been more accommodating when I travelled north from Auckland to photograph the bus. Since this picture was taken back in January 2015, the bus has since migrated to the South Island and was acquired by Road Trips Marlborough at Blenheim with the intention of working tours of the local vineyards and wineries! It is currently in the hands of Gary Wright (Road Trips) undergoing a slow renovation on his premises, so it may be a while before we actually see her back on the road. 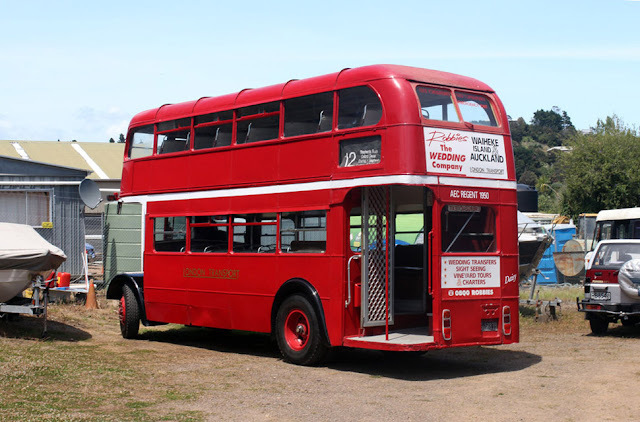 Focus Transport is very grateful to Richard for allowing us to post this, and show the lengths that some of us go for a hobby, albeit by the excuse of a holiday, to locate and photograph buses old and new. 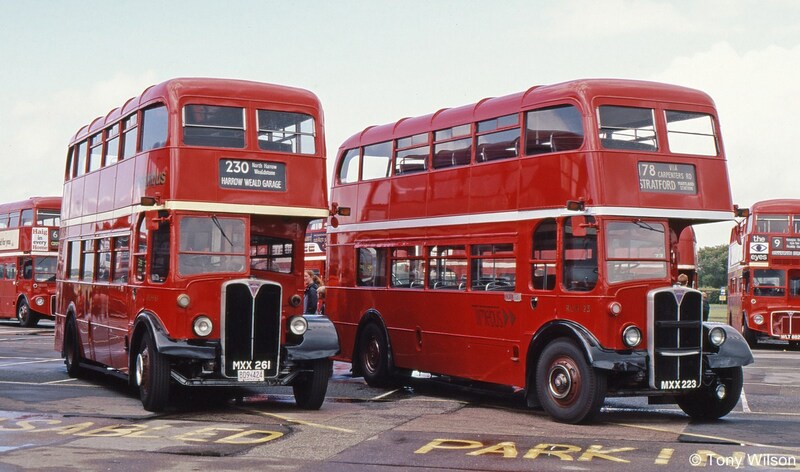 The London Transport RLH-class was made up eventually of 76-buses in two batches RLH 1-20 (KYY 501-520) and RLH 21-76 (MXX221-276). 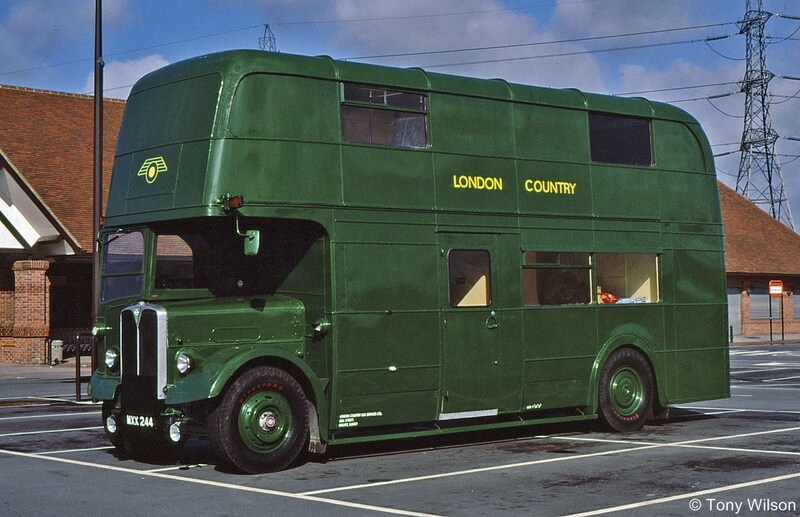 They were AEC Regent III with Lowbride Weymann L56R bodywork and supplied first in 1950 to the ‘green’ Country Area and later in 1952 to the ‘red’ Central Area of London Transport (LT). Their purpose to provide double-deck bus operation where low bridges and other height issues precluded the standard highbridge type of operation. In 1950 Midland General had ordered a batch of the lowbridge type, but in the end only required ten such models. The production company were left with a surfeit of 20-buses, which were duly acquired by LT and initially placed into revenue-earning service on Country Area routes to the south of London. 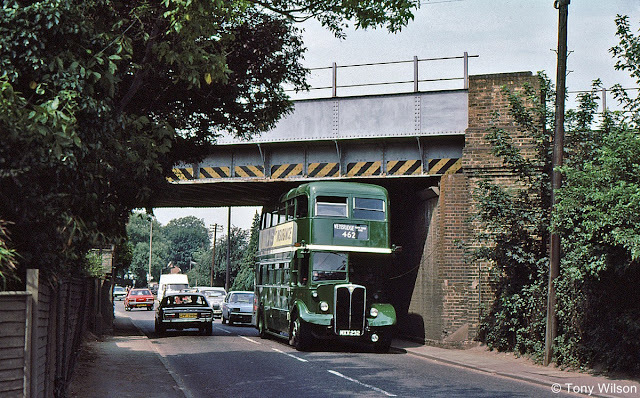 Later others were placed into service on Central Area routes, where there were height restrictions. However, in 1966 major re-shaping changes were under way, especially in the Central Area and the type was removed from the Country Area during 1970 and the Central Area in 1971. A handful of the type remain in preservationist hands including one (RLH 44), which was converted to a uniform store.